The F-35 has also blown up S-300 sites in Syria. Would you happen to have a link for this. Tried to look for it. Couldn't find a news article. hornetfinn wrote: Replicating any kind of ground based threat system is pretty easy nowadays with LVC. I'm not very famillar with LVC, would you have a link for this that can get me up to speed? Israel has released videos of SA-22s being destroyed (at least three, probably more) captured by Delilah on-board sensor. Israel did conduct multiple strikes after Russians deployed S-400 and after Syrians received S-300PMU from Russia, including as recently as 13th of March. However, there are still doubts whether Syrian SA-20 is operational or not (see the Israel thread, viewtopic.php?f=58&t=29374&p=410845#p410845). No parts of SA-20 system were confirmed to be destroyed as of now. hornetfinn wrote: And S-400 is just an upgraded S-300, not really a totally new system. It uses the same missiles and radars or their upgraded variants. So it's not really that huge improvement in capability over S-300PMU variants. Especially when it comes to RF exercises where many things can be and are simulated. 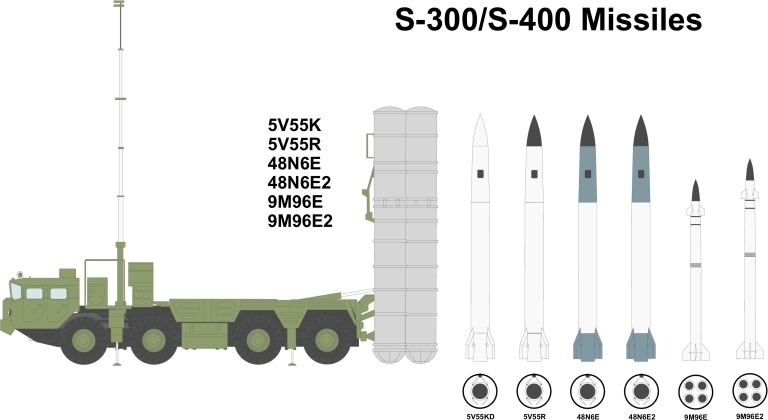 I assume the biggest differenz between S-300 and S-400 are the 40N6 missile, with allegedly 380 km Range. But it isn't sure, if she is finally in service know. The biggest difference is that S-400 is build in Russia, whilst S-300 was a system built in Soviet Union, with many sub-components coming from all over the place, most notably Ukraine. That's why Ukraine can maintain and produce various new/upgraded subsystems for their SA-10s. The 400 km missile is a nice bonus. That's also the impression that I have regarding the S-300 and S-400 systems. and by looking to the image above, the 5V55 missiles are only used in the S-300 while the other two series, the 48N6 and 9M96 are used on both S-300 and S-400. So I would say that this together with the fact that both systems are basically and externally identical is one more indication that the S-400 is in fact a S-300 upgrade. I also gather that (like swiss mentioned) the 40N6 should be exclusive to the S-400. S-400 sure is an impressive piece of kit. But I see a lot of people comparing it to the Patriot. However I think this is wrong, I personally think the S-400's American equivalent should be the Aegis defense shield. hythelday wrote: The biggest difference is that S-400 is build in Russia, whilst S-300 was a system built in Soviet Union, with many sub-components coming from all over the place, most notably Ukraine. That's why Ukraine can maintain and produce various new/upgraded subsystems for their SA-10s. I was thinking more from a technical point of view. ricnunes wrote: So I would say that this together with the fact that both systems are basically and externally identical is one more indication that the S-400 is in fact a S-300 upgrade. Yes it seems very likely. zero-one wrote: S-400 sure is an impressive piece of kit. But I see a lot of people comparing it to the Patriot. However I think this is wrong, I personally think the S-400's American equivalent should be the Aegis defense shield. On paper it seems the case. But I would be careful with technical information from Russia about their weapon systems. Some Ranges are only available under spezial conditions, or there are weapons they never reach ioc. So if we're being honest here, American doesn't really have a land based, road mobile system like the S-400/500. Why is that? I know we have THAAD/AEGIS but Patriot doesn't really compare. I would have thought we would have built on Patriots success, or at least perception of success during Gulf War I. Having something equivalent to S-300/400/500 would decimate the Russian air force, who have virtually no stealth aircraft. They'd be sitting ducks for every NATO country that bought such a system.. Doesn't it? It has a 117ft^2 GaN AESA main radar with fielding beginning in 2017. I imagine the detection capabilities completely eclipse those of S-400, though they are not publicly stated. It does lack a VLRM, true, but that seems to be the only thing it gives up to the S-400. mixelflick wrote: So if we're being honest here, American doesn't really have a land based, road mobile system like the S-400/500. Why is that? I know we have THAAD/AEGIS but Patriot doesn't really compare. These ultra long range SAMs from Russia claims engagement ranges that occurs only under ideal conditions that hardly exist in operation settings, such as engaging a slow big bomber flying at high altitudes directly at the SAM battery without adequate EW protection. Modern 4.5gen fighters with reduced RCS, advanced ECM and expendible countermeasures, utilising terrain masking can greatly reduce the engagement distances of S-400s. What the S-400 lacks is an elevated sensor which can generate weapons quality track and an advanced datalink to share such engagement data. And once its radar is taken out, the entire system becomes useless. And don’t bother with the fantasy that Pantsirs can take down saturating cruise missile attacks against the S-400’s radar. Isn't MEADS the Patriot follow-on that the US is developing with Germany? sprstdlyscottsmn wrote: [Patriot] has a 117ft^2 GaN AESA main radar with fielding beginning in 2017. It looks to me like the Patriot radar AESA upgrade was postponed. The Patriot will also get a new radar, an active electronically scanned array (AESA) with greater range and sharper discrimination. Industry could deliver this “lower tier AESA” today, Shyu said, and the planned program start is 2017, but budget cuts may slow that down. Taking years to decide, the service finally moved forward on a competition to replace the radar last year and chose four companies to come up with design concepts for the capability — Raytheon, Lockheed Martin, Northrop Grumman and Technovative Applications. Earlier this month [October 2018], Raytheon and Lockheed were chosen to continue technology development under that program. steve2267 wrote: Isn't MEADS the Patriot follow-on that the US is developing with Germany? Yes and no. MEADS is it's own system but it uses the PAC-3 MSE missile from the Patriot system.